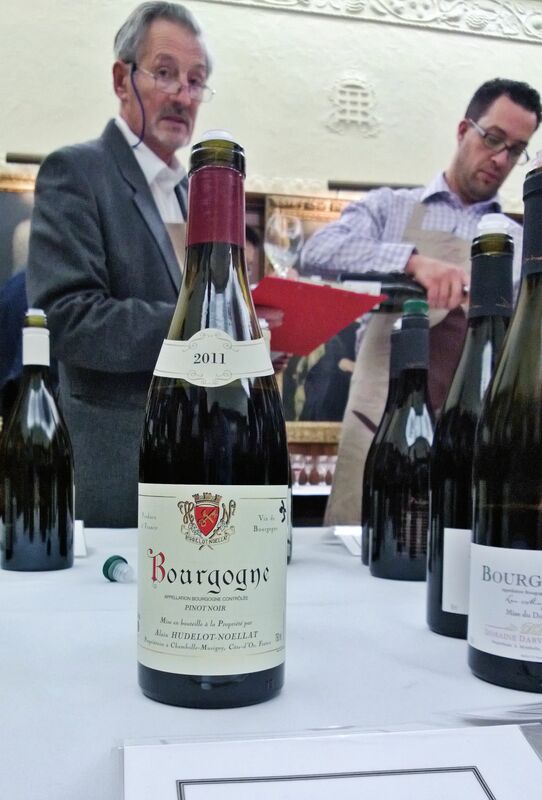 Howard Ripley’s 2011 red Burgundy tasting was an excellent event. A broad range of producers covering a good assortment of appellations were show, allowing one to get a feeling for the vintage across the Cote d’Or. The impression it gave me was that the vintage is very good at best, but sadly quite inconsistent with a lot of wines not performing well. The problem was one of green bitterness probably caused by unripeness, although I’m sure the fans of insect-related conspiracy theories might have found a new bug of ultimate Burgundy-destroying ability to blame. The extreme popularity of the event may be is good news for Sebastian Thomas (who owns Howard Ripley and so wants lots of people to buy his wines), but makes it a bit difficult for those of us of an anxious bent to taste everything and give all the wines the attention they deserve. Consequently I hope you will forgive me not reporting on every wine at the tasting. Despite that, it is a great tasting and I am very grateful to Sebastian for inviting Team Elitistreview to attend. The venue was super! Right, to the tasting notes! All prices are in bond unless otherwise stated. Of course, it may just be the state the wines are in at the moment, but based on this showing Hudely-Noodly produced a range of stinkers in 2011. The Bourgogne Rouge (£57 for 6) was simply disgusting, thin with bitter, acrid flavours of total repulsion. Not on your nelly. 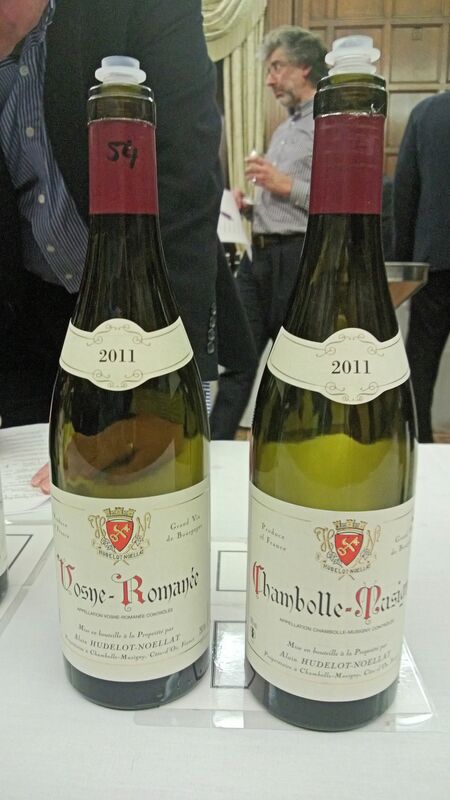 The Village Chambolle-Musigny (£138 for 6) was also thin and insipid, but it tasted quite a lot like Vosne-Romanee. The Vosne-Romanee (£138 for 6) tasted even more like Vosne-Romanee and was a shade better, but it was still pretty green. 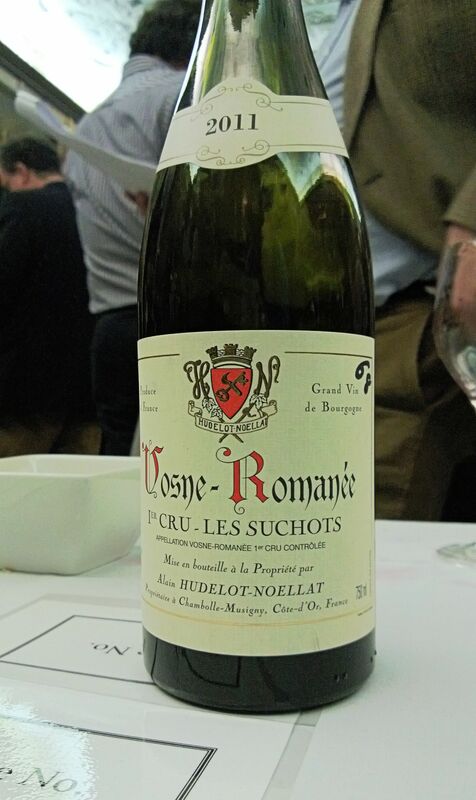 There was a flashier Vosne-Romanee on show the Premier Cru Les Suchots (£297 for 6) and whilst this had more concentration and fruit, the palate was still quite bitter. Not worth scoring. 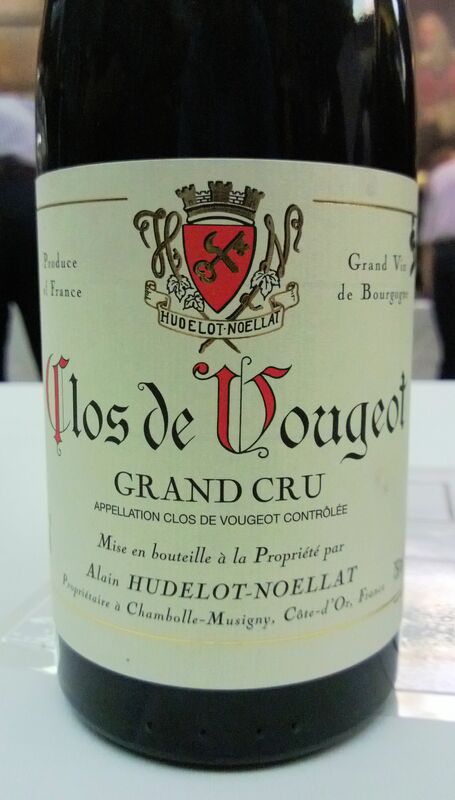 Winning the prize for most disappointing wine from this producer was the Clos-de-Vougeot Grand Cru. There was none of the expansive grandeur and complexity one wants from a Grand Cru, just more of the same green, thin bitterness. It was a real shocker. I hope these wines were just showing badly, rather than being made badly, we’ll see when they hit the shelves. Jump back to producer index . Only l’Arlot’s first wine was a disappointment and that’s a wine I’ve never really got on with anyway. The Cotes-de-Nuits-Villages Clos du Chapeau (£87 for 6) was just insipid and dreary, I hated it. L’Arlot’s two Nuits-Saint-Georges Premier Crus, Clos de l’Arlot (£213 for 6) and Clos des Forets Saint Georges (£219 for 6), were both charged with lively bright fruit and a good earthy richness. The Clos de l’Arlot seemed more elegant whilst the Clos des Forets had more power and a touch more complexity. Two very good wines. Comte Armand’s Auxey-Duresses Premier Cru (£84 for 6) is usually one of the great bargains from Burgundy, and I didn’t think it disappointed in 2011. It is always a tough and vigorous wine, but as usual there was enough fruit to keep this balanced and make it an exciting little bruiser to drink. Give it a few years. 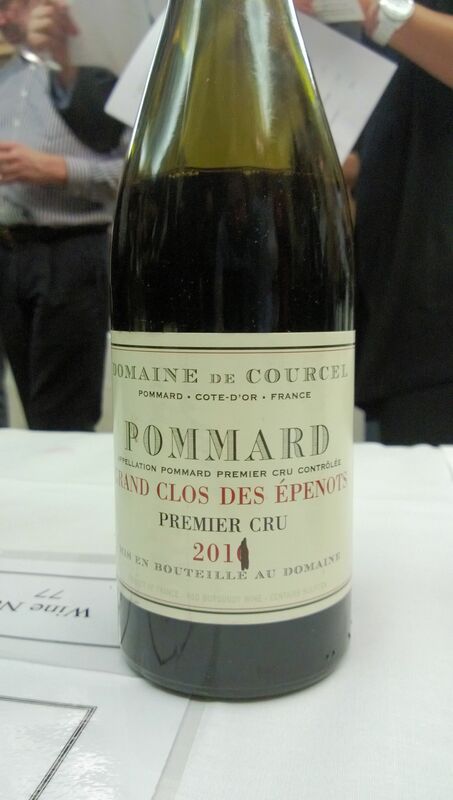 Pommard Premier Cru Clos des Epeneaux (£360 for 6) prowled sveltely to its place at the high table of 2011 red Burgundies. It had a powerful tannic structure, but it wasn’t bitter or green – indeed it was quite silky in a masculine sort of way, but like one of my shirts… The bright, fresh fruit this vintage can show when done well was here in abundance and the wine certainly had the balance and complexity to age really well. A seriously fine wine. First up was the Santenay Premier Cru Clos Tavannes (£138 for 6) which was a bright, fresh wine of vivacious fruit, lively acidity and enough structure to give you something to work with. It was quite impressive for this relatively minor village – I liked it. The Volnay Premier Cru Clos de la Bousse d’Or (£240 for 6) wasn’t quite the immediate charmer, but it had good fruit masked slightly but its somewhat tough tannins. They weren’t green or bitter so I was happy that the wine will come into very good harmony when it is finished – especially if given enough cellar time. This was a rigorous but fine Volnay Premier Cru. 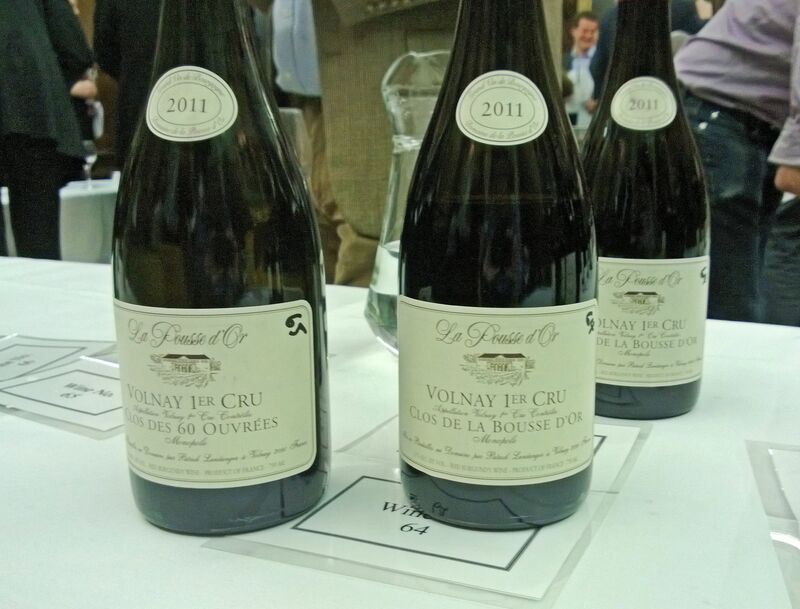 Slightly more obvious in its charms was the Volnay Premier Cru Clos des 60 Ouvrees (£276 for 6). For sure, it had the structure to hang around, but also plenty of really attractive fruit that made me want to deflower my tasting sample with lustful enthusiasm. You want to age it, but if you want me to come and explain its charms as soon as you receive yours then I’m more than happy to (pending receipt of travel costs). I tasted two lovely wines from Clavelier. The Vosne-Romanee Combe Brulee (£192 for 6) was a richly fruity, exotic and classy Village wine that had good acidity and a really pleasing silkiness to the tannins. 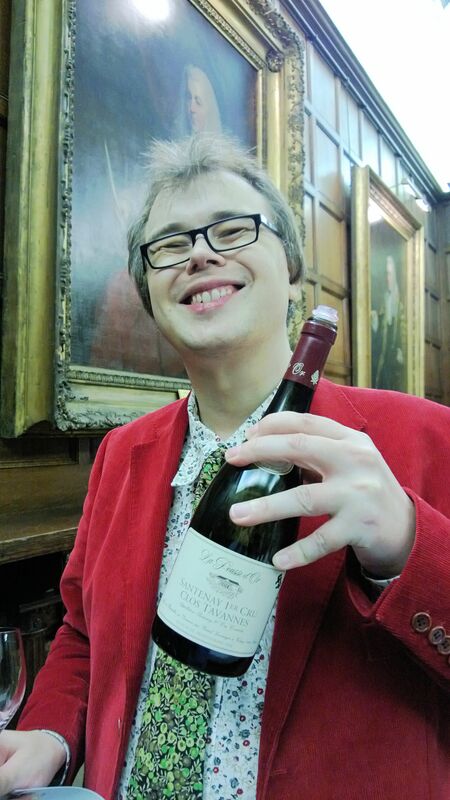 Far more serious was the Vosne-Romanee Premier Cru Aux Brulees Vieilles Vignes (£300 for 6) which throbbed with complexity and intricate earthiness. The fruit was quite delicious. This was an excellent example that lived up to the high expectations I have from what is one of my favourite vineyards. I declare an interest as the winemaker, Jeremy Seysses, is such a good friend I’d give him one of my lungs if he asked. That being said, I found the Morey-Saint-Denis (£120 for 6) to be a really good example of the village. It was charged with lovely, somewhat floral, fruit and a powerful but smooth tannic structure. Very tasty and this is a great price. It’s normally a toss-up between Comte Armand and de Courcel as to who makes the best Pommard in any vintage. De Courcel started brilliantly but the ending was confusing. 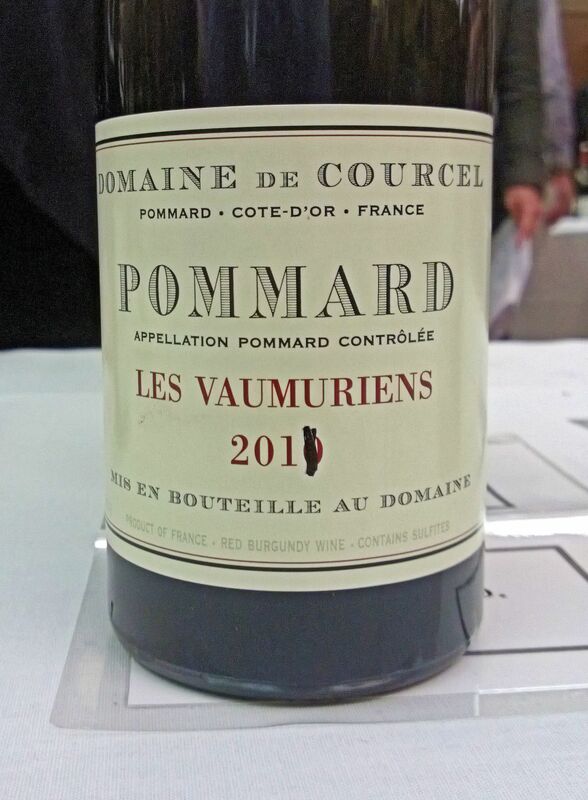 I loved the Pommard Vaumuriens (£210 for six) but it might just have been too nice to be really serious Pommard. The fruit was abundant and extremely attractive, throbbing with life and bursting with scrummy-liciousness. Good but not particularly high acidity and the tannins were quite soft – not Pommard tannins at all. It may not have been type Pommard but I loved it. The Pommard Premier Cru Grand Clos des Epenots (£288 for 6) was spiffing! Complex fruit, serious tannins and bright, harmonious acidity. It throbbed with extremely grown-up Pommard style and had a sophisticated earthiness that was really satisfying. This was more or less as good as the Comte Armand Clos des Epeneaux but as it’s cheaper this seems like the clever buy. It was the cat’s freaking arse. The Pommard Premier Cru Les Rugiens (£360 for 6) was confusing after the previous coruscating star. I found it overly extracted with tough, bitter tannins that would never yield to ageing and a confused, understated fruit character that was overwhelmed by the severity of the tannins. I hope it was just the sample showing badly on the day, but this was a major disappointment considering this is normally a wine I adore. Frederic Esmonin continues to produce high-quality wines and not charge the Earth for them. I like that. His Gevrey-Chambertin Vieilles Vignes Les Jouises (£105 for 6) was a delightful Gevrey Villages with lots of silky fruit and fine tannins. Quite complex too. A bargain at this price. The price asked for the Gevrey-Chambertin Premier Cru Lavaux-Saint-Jacques (£150 for 6) was low enough to make one doubt all the stories one hears about Burgundy producers’ greed. It was just super; throbbing with fruit, totally harmonious with its svelte tannins and star-bright acidity. A fabulous wine that won’t break the bank. I was a fool not to try the Ruchottes-Chambertin Grand Cru; my excuse is being in London for too long for my nerve to handle. As I was fleeing the tasting room in panic Sebastian kindly offered us a quick taste of some Rousseau samples he had hidden away. I wasn’t in a great state to record tasting notes but I can tell you that, in increasing order of awe-inspiring fabulousness, the Charmes-Chambertin Grand Cru, Gevrey-Chambertin Premier Cru Clos St Jacques and Chambertin Grand Cru were mind-pulpingly good. Amazing stuff. And that’s it, some great wines there I’m sure all who attended would agree. Many thanks again to Sebastian Thomas of Howard Ripley for hosting such an enlightening event. Now… what to buy…? Davy Strange on Opus 1,500: What is wine and what is it for? Jonathan Kalman on Opus 1,500: What is wine and what is it for?